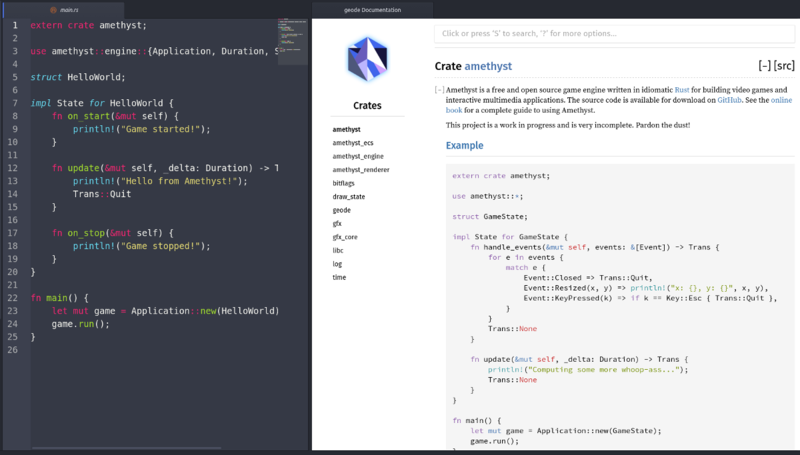 View your Rust project docs right inside of Atom. An Atom package to make viewing your project’s Rust documentation much easier. This plugin will open up your current Rust project’s documentation in a seperate pane so you don’t have to have a web browser open at the same time as atom. Note that these will open up your own rust docs, which is useful if you are using a project framework such as amethyst, or tcod-rs. This is still in development, and feedback is appreciated. You can install the package directly from your atom text editor by searching for rust-doc-viewer in packages. You can also install it from the commandline using apm install rust-doc-viewer. A big thanks to Atom Web View for a nice framework for having atom panels with iframes in them. I encourage you to check it out.